Actress Amy Beven waiting for ‘action’ to be called. Kate Loven and Amy Bevan demonstrating the layers of 18th century clothing. 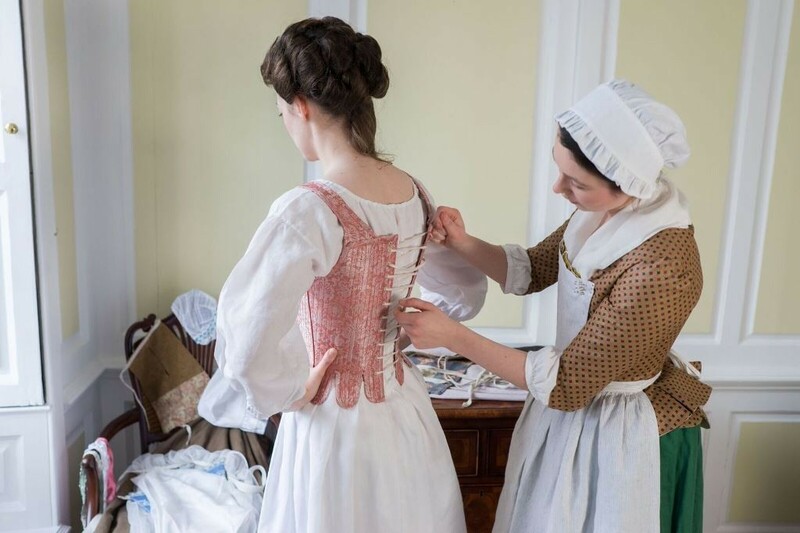 Costumier Pauline Loven pinning the front of the gown to the stomacher. 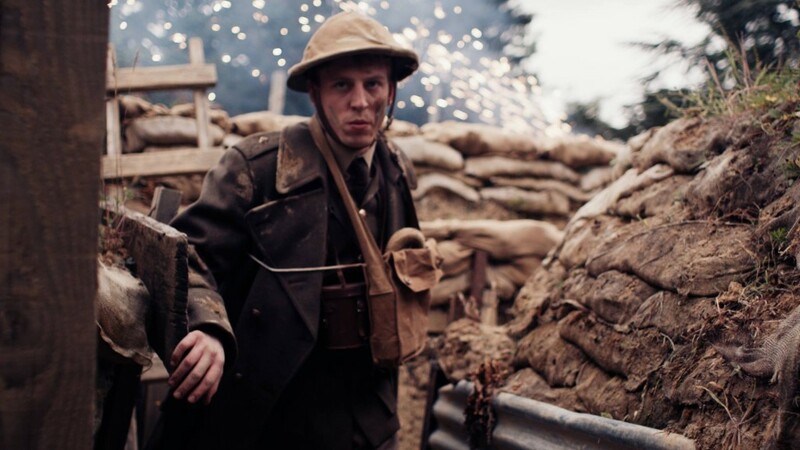 In our film ‘Tell Them of Us’, we told the story of WW1 casualty, Robert Crowder, who died at Passchendaele aged just 21. We told his story through his letters and from the perspective of his family at home. We didn’t however, in the scope of that format, explain what had happened to Robert’s brother William when he went missing and what he had done to earn the DSO. 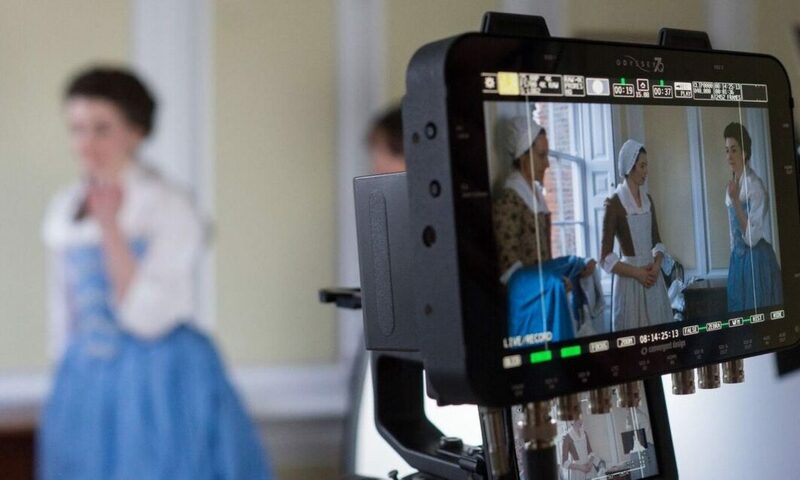 Continuing to tell the Crowder family’s story with a drama-documentary has allowed us to fill in the story of William and his future wife, Violet, and to move forward a little to show how the war years shaped their future attitudes. 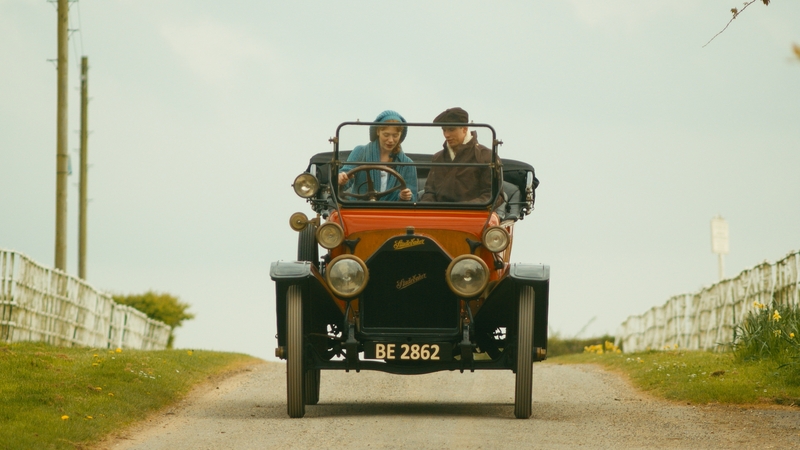 Here are two location screen shots from the making of ‘William’s Story’. Nurse Violet Pearson (Tiffany Haynes) and patient Trooper Thame (Alexander Doddy). 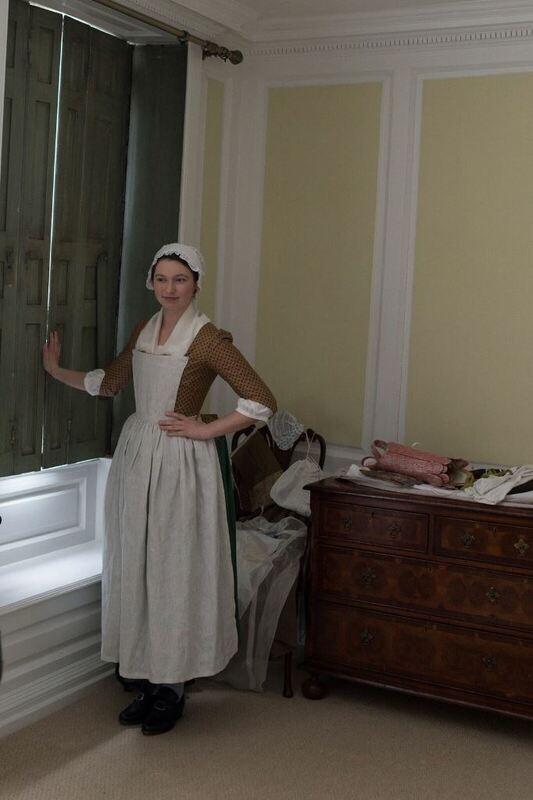 Pauline Loven (Costumier) doing the costume check on location. 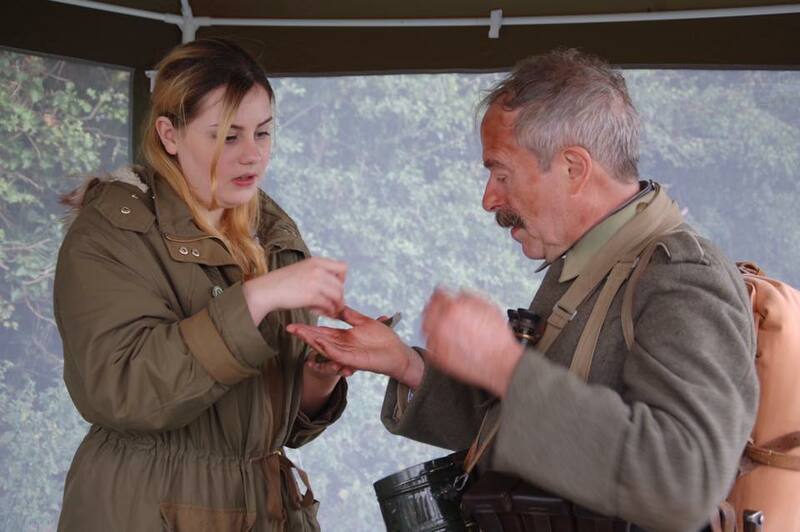 Saffron Rogers (MUA) adjusting makeup on location. 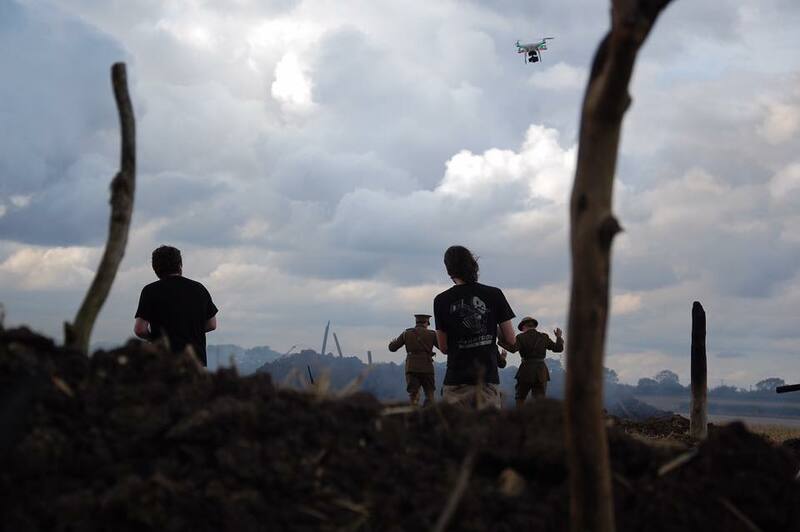 Nic Loven (Director) and Alexander Pollard (Sound) filming with a drone camera. Film Crew at Work. 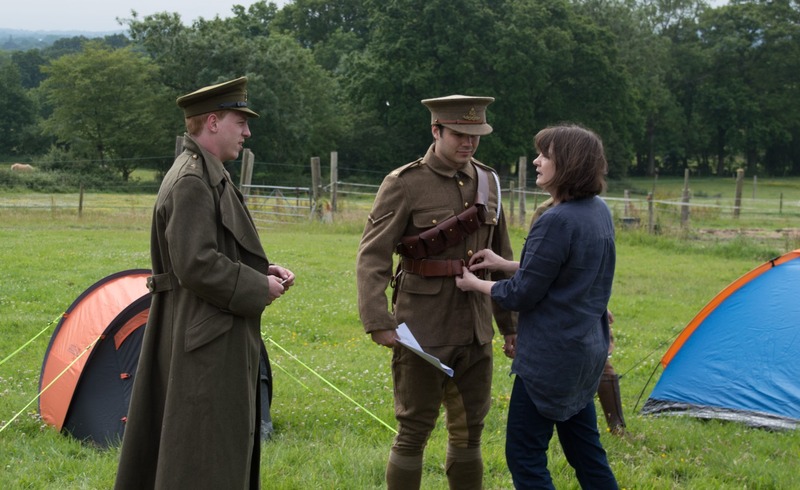 Centre: Bryony Hooper (1st AD) Left: Alexander Pollard (Sound). Mason Carter on clapper board. 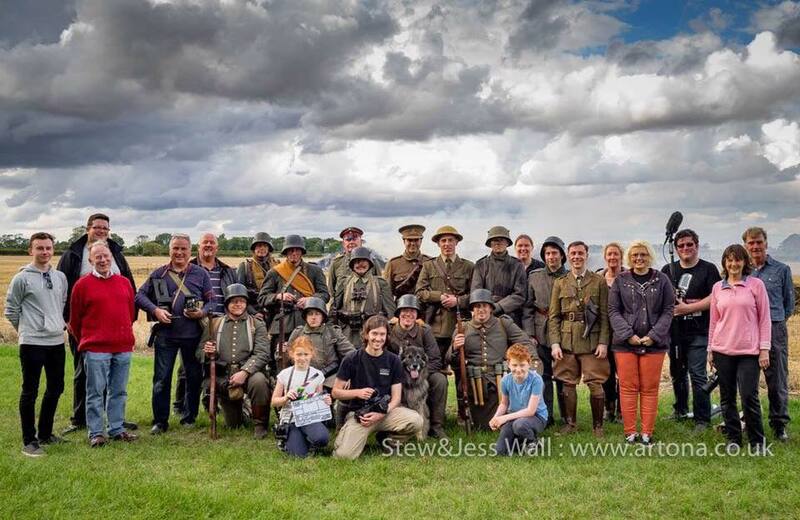 The entire cast and crew from Location II, Lincolnshire. 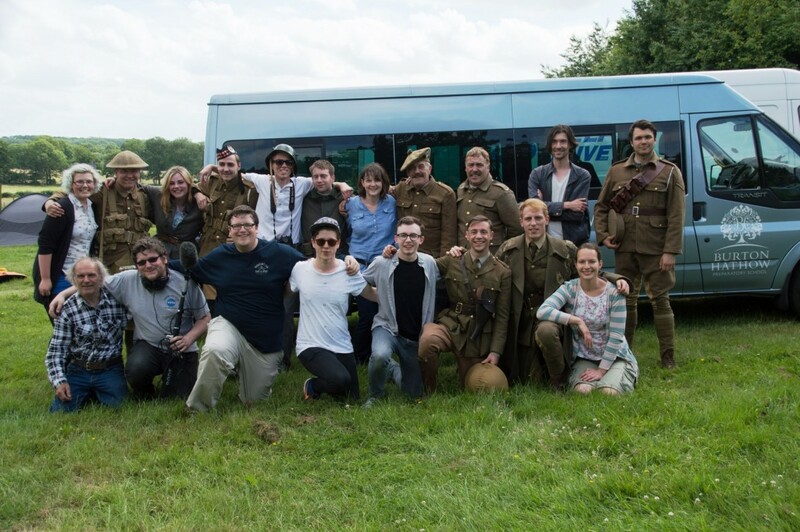 The cast and crew from Location 1, Surrey. We were very fortunate to have the extremely talented and versatile musician/composer Chris Gordon as composer for ‘Tell Them of Us’. Chris is now composing for the follow-up drama-documentary, ‘William’s Story’. 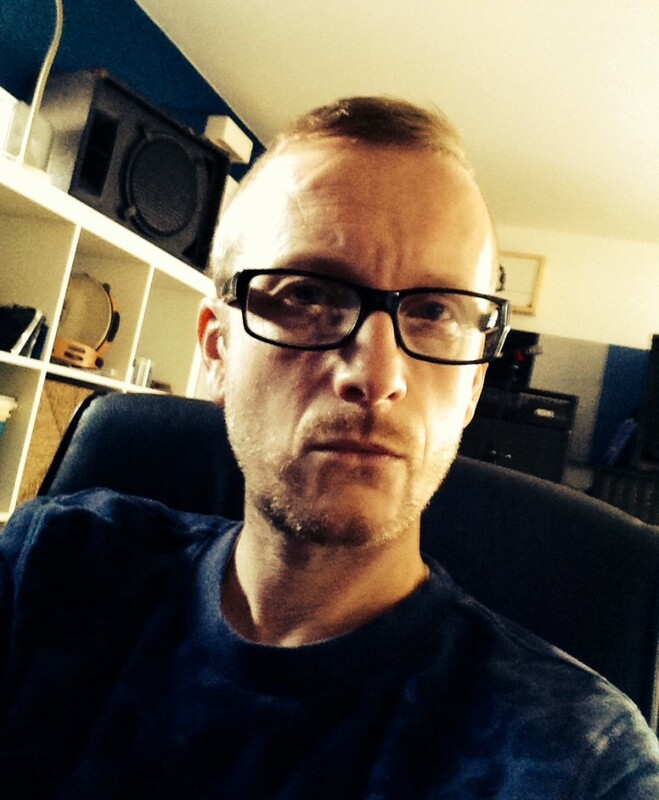 Chris is a musician, composer and producer from Glasgow. As a recording artist he has held record deals with East West, Atlantic, Reprise, Dreamworks and EMI enjoying success with several different groups (as a singer, guitar player and latterly programmer/producer). His interest in composing for Film and Television stemmed from the many synchs he achieved as an artist, his music having been used in such programmes as Grey’s Anatomy, The Vampire Diaries, Smallville and Friends among many others. Turning initially to the world of advertising as a way to learn the craft Chris has had work commissioned on over thirty major campaigns in the last few years. Among these there have been many longer, more cinematic pieces which served as an ideal preparation for his goal. 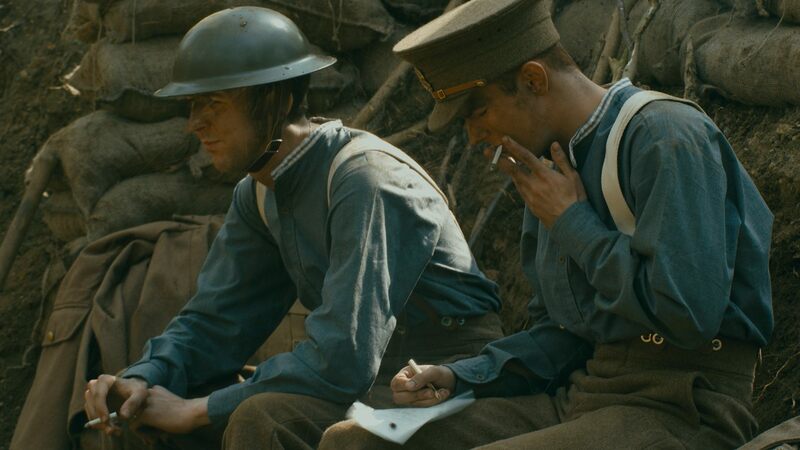 In 2014 he wrote and performed the score for his first film, the WW1 drama “Tell Them Of Us”. The music has been widely praised as an essential ingredient to the films emotional tone and a Soundtrack Album of the recordings will be available in 2015. Equally at home in the world of cutting edge electronic music (in part due to his time spent working with Oscar winner Atticus Ross) or with more traditional orchestral arrangements, Chris’ real passion lies in finding and enhancing the emotional core of any given scene. ‘Over cake and coffee in Woodhall Spa, one Sunday in Spring 2014, I asked Pauline (Loven) if she had any plans for music for the film that her and her daughter Nic were working on. I had heard chatter of it the previous evening and was struck by the ambition they were showing in making a feature length film. Having long harboured a desire to score music for films I found myself always too busy with other projects to seriously seek out any opportunities. Here was one falling in my lap, at least if they could be persuaded it was a good idea. There was very little money in it, they said, but as I was fully prepared to do it for free I counted “very little” as a big bonus. In due course, Nic sent me the teaser trailer she had put together from the first few scenes that had been filmed. She had used some period-appropriate orchestral music (I think it was a piece by Vaughan Williams) and she felt that it suited the mood quite well. I set about replacing this with some new music that attempted to bring a little more depth to the emotion contained in the images. We had spoken of the overall feel Nic was looking for, albeit briefly, and in keeping with the meticulous research, costume design and attention to detail, she wanted the music to feel like it belonged to the period. I was comfortable with this but also felt that if need be I would stray a little from traditional instrumentation and employ some modern production techniques to get the music sitting well with the pictures and dialogue. In this first piece of music I did however stick to the brief, employing some classical guitar to go with the sampled strings and woodwinds that provided the tracks base. Nic seemed happy with the result and after that scenes arrived at a steady pace for the next four months or so. We were both aware that in an ideal world I would have a near final cut of the film to start work with, however this was just not possible given the filming schedule and the deadline for the premiere. So we proceeded on a scene by scene basis on the understanding that I would spend time tying scenes together when the final cut was ready. I would compose for each scene until I felt it worthy of a listen then send it to Nic for feedback. I recall the words “splendid” and “marvelous” being used often in her replies and fueled by this praise and a growing passion for the work at hand I spent many happy hours tinkering on my keyboards and guitars, and shifting things around on my computer screen, trying to find the right tone for each scene. In the weeks leading up to the premiere the work became a little more intense. I had a near final cut now and could see how the film was taking shape. There was gaps to fill and scenes that needed to bleed into one another musically in order that the film flowed easily. At other points I simplified music I had already composed after the arrangements seemed a little dense in context. During the process I had put together a few pieces and a few different soundbeds without any particular scene in mind. Again it was the constraints of time that had brought about this strange way of working. Nic used them on some scenes and they seemed to work but I would often feel the need to go back and tinker further to make sure that they really bedded in well. 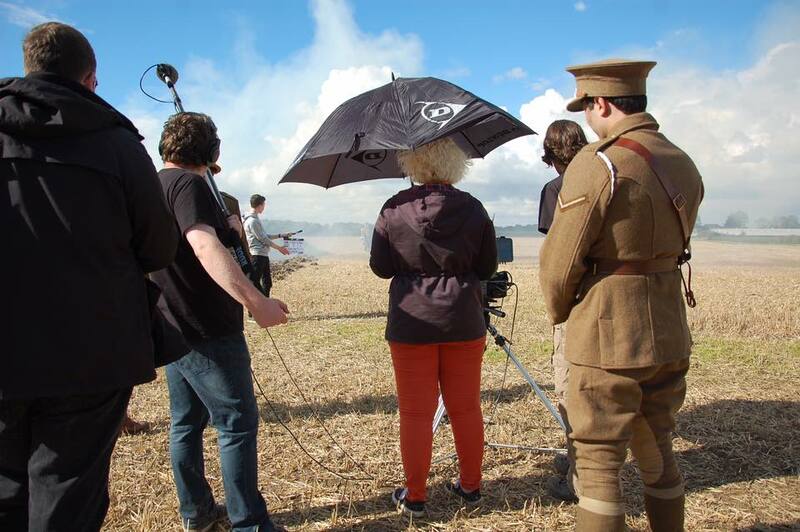 With the anniversary of the First World War approaching we (Crow’s Eye Productions and WAG Screen) felt strongly that we should do something to mark it. After much deliberation we decided to tell the story of one small Lincolnshire war memorial, but we should choose it without any knowledge of the stories it might tell. We had in mind a twenty minute drama documentary. We chose the small village of Thimbleby in Lincolnshire because of its remarkable range of vernacular houses, Victorian village school and working water pump, all surrounding the village church. Only then did we begin to research the war memorial. Many WW1 military records are lost, so we held our breath as we researched, fearing that we may find nothing of the five men listed. We were right too – we found little more than name, rank and number for three of the men on the memorial and only a little more on the fourth. However, we found that the family of one, Robert Crowder, had held his memory dear and had kept a remarkable archive of unpublished material. The family had erected a stained glass window in his memory in Thimbleby Church and kept all his letters written home from the front line. His brother wrote his memoirs and sister-in-law had kept an autograph album through her years as a VAD nurse in the local hospital. Combined with photographs, family memories and artefacts, we found we had enough material for a full length film. We had just the story we wanted to tell, one that represented so many of that generation who were torn from their ordinary lives and thrown into the hell of war. Robert Crowder was not famous; he was neither an officer nor a decorated hero, though he was undoubtedly incredibly brave. He was just a gardener and a country boy who played the organ in his village church and loved, and was loved by, his family. The film, Tell Them of Us, had a charity premiere and was shown at Lincoln’s museum, The Collection, with an accompanying exhibition, for four weekends across November and December 2014. A serialised version of the film is available to view on the Crow’s Eye YouTube channel. Nancy Snowdon – Historian: I am just so impressed with your film! I found it so wonderfully sensitive, well acted, beautifully photographed. We were reduced to tears by it (quite unusual for us). And best of all not mawkish, which it could so easily have been. Well done all of you! And the knitting … looked wonderful. What a brilliant idea. I am so thrilled that I can’t stop gushing and showing it to everyone! It’s a small masterpiece and does you enormous credit! Nicholas Boot, Lincoln Minster School: We took Year 6 and Year 9 to see the film at The Collection this morning: I’m very pleased we did so. It was a very poignant depiction of the family’s perspective and it was very interesting to hear the letters from the sons and see the family’s response. I thought it was a very interesting and moving film: thank you. 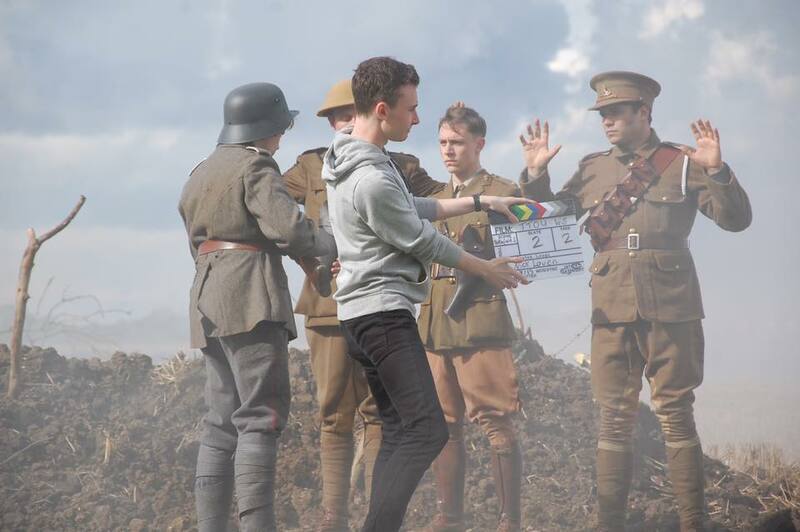 Daniel Brown, Media production undergraduate:Just watched @ww1Film what a beautiful, poignant and emotional film. Glad to have been a small part of it. Some channel needs to pick it up! Deb Gillanders: ‘Having heard about this film & the knitting it inspired from several different sources I went to Lincoln & saw it on Sunday. The whole thing was fantastic – so much attention to detail by so many people & so many angles to the whole project, that all came together so effectively… I hope this exhibition & film travel to as many places as possible. Congratulations! Jo Turner, photographer: Went to the Collection on Saturday morning to see your film and display – loved it, even though it brought tears to my eye. I wasn’t alone, I think a lot of tissues were in use. 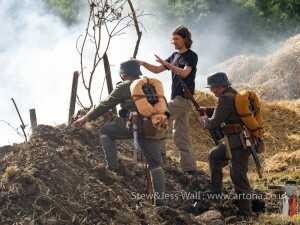 The costumes were excellent and the ‘taste’ of the trenches and explosive scene were amazing. Well done to everyone. Darren J Scales, filmmaker: Go see this!!!! 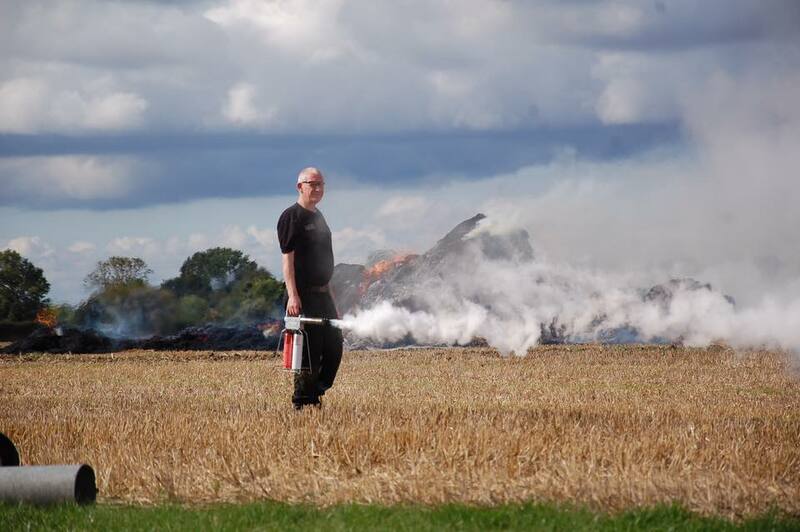 Well done Nic Loven – such gifted filmmaker! Maria Precedo: I recently day-tripped to Lincoln from London especially for the Centenary Stitches exhibition. I was so enthused about it, I emailed the Imperial War Museum in London to see if they’d be interested in housing the exhibition at all. I’ve forwarded their reply below, and leave it to you to take it further, if you want. Mari Roberts – Book Editor: What a fantastic film. Beautiful photography, costumes, music, settings. The tension of the story very well held. Terrific acting. We both cried! Hilary Harrod: Brilliantly done! Get your hankies out, it’s emotional, poignant and true. When Tiffany Haynes approached us to make an actor’s showreel for her, she didn’t expect to find herself featuring on the cover of an American novel as well! Tiffany had the ambitious idea of creating a synopsis of a book, or a book trailer, and had a book in mind: ‘The Lady of the Butterflies’ by Fiona Mountain. This appealed to us all as it was the story of Lady Eleanor Glanville, a 17th century Lepidopterist who discovered a fritillary butterfly in Lincolnshire – now known as the Glanville Fritillary. ‘The Lady of the Butterflies’ was renamed for the American market as ‘Rebel Heiress’. With permission from the author we created this short piece as part of Tiffany’s show reel. 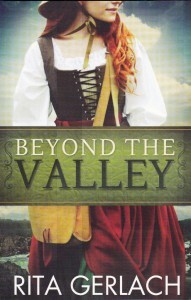 ‘Beyond The Valley’ Book Cover. We donated the small fee for its use as a book cover to an American charity ‘A Home Within‘. If you would like to have a show reel made please contact Nic Loven. 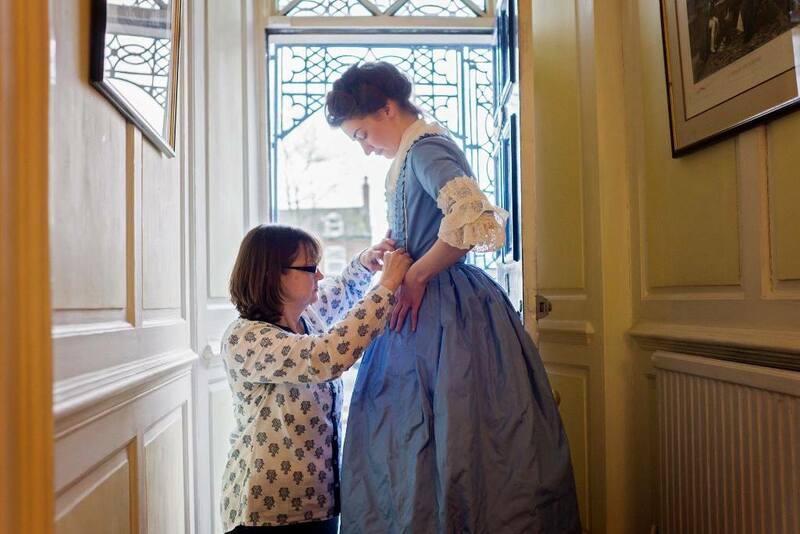 If you are interested in having a showreel which involves the costume department, you can also contact Pauline Loven to discuss the options. © Nick Loven 2000-2017 (except where otherwise indicated). This website, and the photographs and text on it, are copyright works under the UK Copyright, Designs and Patents Act 1988. They are protected internationally under the Berne Convention. They may not be reproduced in any form or incorporated in any other website or other electronic medium without the written permission of the copyright owner. The moral rights under Sections 77-89 of the UK Copyright, Designs and Patents Act 1988 of the author(s) of the works in this website are hereby asserted.